There has always existed at the heart of The Muppets a tension between a love of old-fashioned, slightly creaky Vaudevillian showmanship, and a simultaneous desire to mercilessly critique that style. After all, Jim Henson not only created a troupe who desperately tried to entertain a frequently uninterested audience; he also created Statler and Waldorf, their most vocal critics. Kermit and co. have always made fun of the artifice of performance, either by directly breaking the fourth wall or skewering the personas of the flesh and blood stars who graced the stage of the Muppet Show, but they've also spent decades trying to put on a show. Fozzie's jokes might have been mercilessly torn to shreds by the patron saints of hecklers, but he kept getting back onstage because there is something noble in trying to entertain, even if you can only do so by failing. 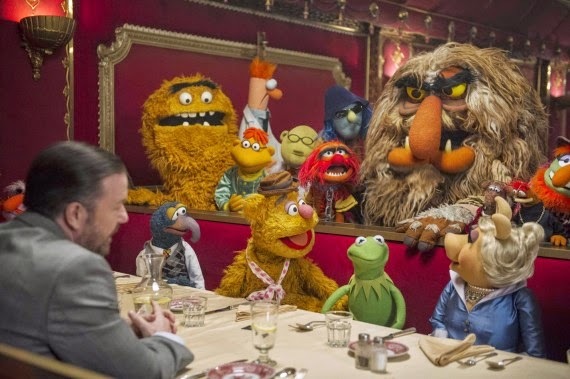 If we are to expand this dichotomy out to a broader view, then you can see it at work in the way that the latest vehicle for Henson's creations, Muppets Most Wanted relates to its immediate predecessor, The Muppets, which served as a simultaneous reboot and continuation of the dormant franchise. One of the keenest pleasures of that film was the way in which the script, written by Nick Stoller and co-star Jason Segel, performed an act of nostalgic jujutsu, making the supposed irrelevance of the characters into their biggest asset. Through the new Muppet Walter (Peter Linz), Stoller and Segel were able to channel their own affection for the characters into a story that played on how out-dated they were, while also saying that they were so out of style that maybe their time had come around again. It made for a rather lovely, surprisingly sincere film about The Muppets as a cultural institution, and as a group of characters who meant a great deal to the people who grew up with them. Yet The Muppets was atypical compared to other Muppet adventures. It was more concerned with reintroducing the characters to a world that had left them behind, and as such didn't make much room for The Muppets to act like The Muppets. That's where Muppets Most Wanted comes in. Where The Muppets had heart, Muppets Most Wanted is about doing anything for a laugh, no matter how easy or cheap. Where The Muppets used Walter as a central figure around which to gather The Muppets, Muppets Most Wanted is about showcasing its ensemble. It feels like as much like a reaction to its predecessor as a follow-up; a case of getting back to business for a series that has always thrived on irreverence and chaos. The sense that returning director James Bobin, who this time co-wrote the script with Stoller, is pushing back against his own previous film begins from the very first frames of the film, which are actually the very last frames of The Muppets. As the camera pans down from the words "The End" written in the sky in the fireworks, it finds the Muppets celebrating that they managed to be in a film again. Once the extras have left for the day, and the characters are left with nothing but a tumbleweed, it leaves them wondering what to do next, a question which is answered when they realise the cameras are still rolling, and that they must therefore be doing a sequel. And how do they mark the start of their second (slash seventh) film? By singing a big musical number called "We're Doing a Sequel", of course. The brazenness of that title and the way in which Bret McKenzie's sly lyrics illuminate the marketing groupthink behind commissioning another Muppets movie suggest that everyone involved knows just how tough it is to follow a critical and commercial hit, even going so far as to admit that sequels are rarely as good as the films they follow. That could be read as an attempt to lampshade any apparent laziness on their part, and there is some evidence for that contained in the fairly uninspiring plot, which sees The Muppets going on a European tour at the urging of their new agent Dominic Badguy (Ricky Gervais). Badguy insists that his surname is French and is actually pronounced BADGE-y, but more importantly he's not an agent, but a notorious criminal working with Constantine (Matt Vogel), an evil frog who looks almost identical to Kermit (Steve Whitmire), with whom he soon swaps places. With Kermit confined to a Siberian gulag presided over by Tina Fey, Constantine and Dominic use The Muppets' performances as cover for a series of heists, all the while pursued by CIA Agent Sam Eagle (Eric Jacobson) and Interpol Agent Jean Pierre Napoleon (Ty Burrell). Burrell's ridiculous accent and even more ridiculous physicality make him far and away the best cast member who isn't being manipulated by an uncomfortably placed hand. The three strands of the film criss-cross the globe and eventually converge at The Tower of London, but Muppets Most Wanted couldn't be less concerned with the mechanics of its plot if it tried. Lip service is paid to the idea that The Muppets take Kermit for granted because he's the one who always tries to rein in their craziest, most dangerous ideas. Meanwhile, the relationship between Kermit and Miss Piggy (Jacobson), which rivals the marriages of Elizabeth Taylor and Richard Burton for sheer turbulence and drama, gets a few more twists and wrinkles thanks to the efforts of Constantine in his role as usurper of Kermit's identity. Ultimately, the film's main concern is cramming as many jokes in as possible. While many of them fall flat, the sheer variety ensures that the film is rarely dull. There are high-brow gags, such as a brief Seventh Seal parody featuring The Swedish Chef (naturally) and there are fart gags; there are moments of pointed showbiz satire (much of it aimed at The Muppets) and moments, such as a look at what Piggy and Kermit's kids might look like, which are weird and disturbing; there are broad jokes about cultural (i.e. French) stereotypes and there is an oddly specific joke about the way in which Danny Trejo's cinematic persona seems so inseparable from his real-life one. In short, there are jokes for pretty much everyone, and a lot of them are pretty funny. Unfortunately, in trying to make a film that has something for most people across a pretty broad spectrum, Muppets Most Wanted winds up seeming pretty unfocused and diffuse. This is particularly apparent with the musical numbers, which are often indifferently staged and are lacking the visual energy and witty staging that made those in The Muppets so much fun. (A duet between Constantine and Dominic is especially flat and ugly, with leaden pacing and rote staging.) It's a shame, because the songs themselves, which display a wit and invention that suggests that Bret McKenzie is well on his way to being his generation's Harry Nilsson, are pretty great. Yet they are so shoddily realised that they feel completely out of place, and further underline just how little is holding the film together. Still, if you're forgiving of wonky storytelling when the gags are strong, as I am, then it's a fun, if wildly inconsistent, couple of hours, with a ramshackle, anything goes spirit that is arguably a better tribute to Henson's original work than The Muppets more reverent approach.